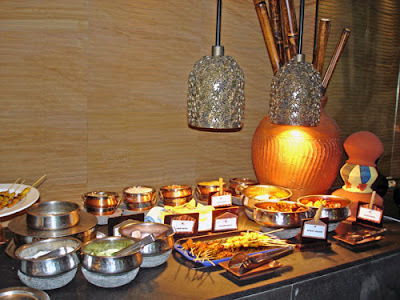 Malaysian buffet table at Rasa Sayang Hotel. We had a FEAST and a blast. We didn’t stop talking about it for days. I chose the topic of yin and yang, hot and cold, the balance in Asian food. So, hot spicy chilies and cold toufu. 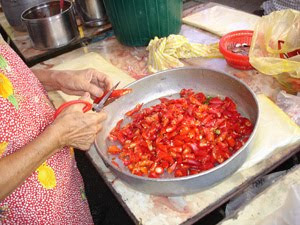 Lady snipping red chilies with her bare hands! I asked her how her hands didn’t burn and she said she’d been doing it for 25 years and used to it, ouch. After dealing with chilies, wash your hands IMMEDIATELY and do NOT touch your eyes or go anywhere near your face. My mom used to put chilies on her thumb and when my sister and I didn’t eat our dinner fast enough, she’d put that thumb in our mouth. Boy, it sure made us eat a lot faster, we forgave her. It also taught us to eat spicy at an early age, ha, ha. Oh, I have some good photos of my sisters and mom. So many to share with you. 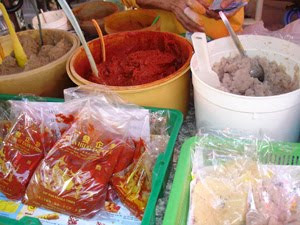 This lady was incredibly deft at making up whatever curry paste you wanted on the spot. As you can see, she had pots of garlic, shallots, ginger and chopped chilies and all sorts of spices like cumin, turmeric (by the way, I just realized in Asia, we pronounce it tur-meric, not tu-meric). I took great shots at the Tropical Spice Garden. More later. Now, I really appreciate CurrySimple even more, it’s quite a trick to balance all the right spices. Fresh toufu, soft on the left and firm on the right. The texture was so creamy and yummy. My sister, Lynette (who lives in England) loves the way I stir fry toufu till crispy. As mentioned, the non-stick was HORRIBLE, I had to be patient, it took forever and needed more oil than I was used to using! Ugh… I just added a splash of tamari, lime juice and Lingham’s hot sauce (or your favorite chili sauce) and crisp up some more, the juices help to carmelize. Ralph (my hubby didn’t come, someone had to take care of cat and business) and I prepare toufu like this quite often for lunch and add on top of field greens, delish! many folks cannot get the hang of wok cooking. frustrating cooking experiences in my life. Cooking in my lightweight, cast iron wok and gas stove at home is a breeze compared to that ridiculous non-stick. If people only knew what a DIFFERENCE cast iron makes. Because you cannot use non-stick above medium heat, you cannot crisp up anything. My sister loves the way I make Crispy Toufu, so I wanted to please her but it was just NOT possible. The handle kept tipping over making it very dangerous so I had to keep holding it the whole time! The other problem was the flame from the gas stove was flaring wide instead of being focused in the center like my Iwatani 10,000 btu stove. On my website, I get into this subject in-depth and also mention the many uses for a non-stick wok because it’s useless for stir frying! One is to use it for salad which we did everyday. Toufu is delicious if you treat it right, just needs a little TLC. Most think it’s bland but that’s the beauty of it, it absorbs the flavors of whatever you’re cooking it in. 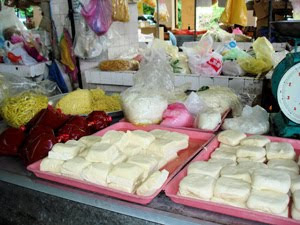 There are many different varieties in the Asian markets like baked, puff, flavored, try some. Sorry, the presentation was really bad but it’s all we had. Everyone was sick of me saying, “don’t eat yet till I take the photo!” This Quai Teow is the 3rd best after my mom’s and Lynette’s. It was so ridiculously cheap, only $3 US for the whole plateful, not much shrimp but quite eggy. We had it twice from the same stall, it was so good. 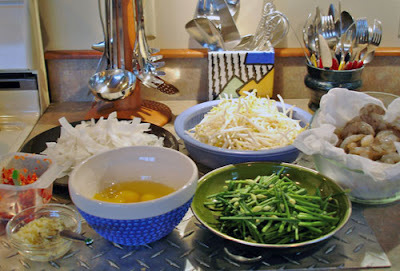 I will post Lynette’s Quai Teow she made when we were visiting my other sister, Valerie in Asheville, NC! It’s so much work. They claimed it took all day because the bean sprouts had to be topped and tailed. I promise I’ll work on adding more Penang food journeys. Our favorite was at Rasa Sayang, a Shangri-La Hotel which was conveniently across from where we were staying in this northern coastal village called Batu Ferringhi (many different spellings.) 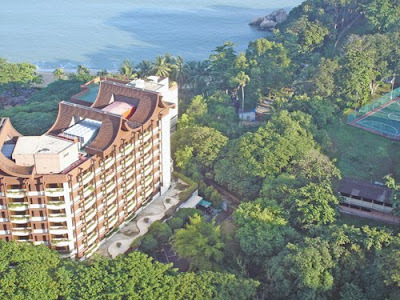 I took this photo of Rasa Sayang from my bedroom window of our rental apartment. I must have taken 30 shots, the presentation and quality of food was INCREDIBLE and so worth it! Well, our friend Rose had a 20% discount card which made it even more affordable. Dirt cheap at $20 compared to a buffet in a classy hotel in USA. And if there’s anyone who knows more about Penang it is Bee at Rasa Malaysia, I asked her where to visit when I was going to Penang. She does a fantastic job of promoting Penang, her hometown. Her blog is just one of the most beautiful ones I’ve come across. 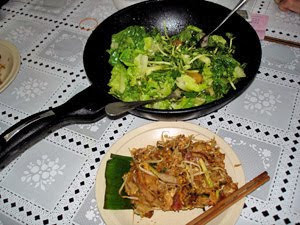 Full of wonderful and amazing dishes from all over Asia, she’s even started a new blog for Nyonya food (mix of Chinese Malay.) I’m not sure if Bee ever sleeps. I’m trying my best to take shots to illustrate my story. My emphasis is showing that weeknight dinners can be easy, no recipes required. Use what you have, always making sure you have a good balance of protein and carbs and Keep Cooking Simple and Tasty. Check the Travel section for more of my food journeys in Asia…and here’s another of my post on Penang Food Stalls. I am quite certain I’ll be told many new stuff right right here!